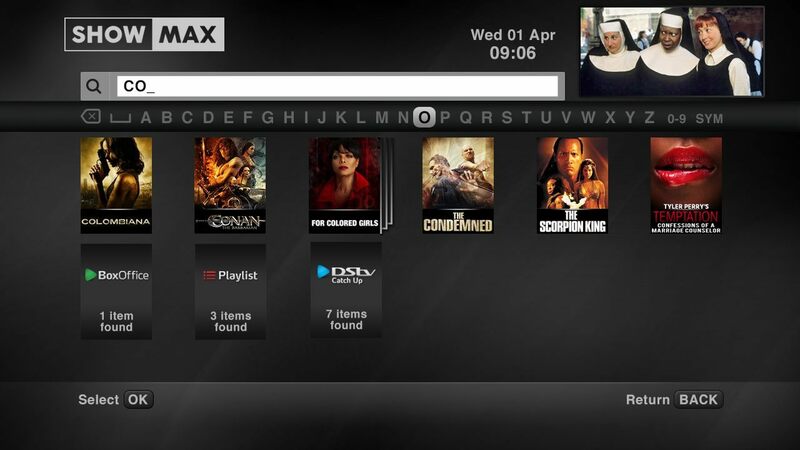 Using Showmax on your DStv Explora* is as easy as 1, 2, 3! * Showmax is available on any DStv Explora connected to the internet. Monthly DStv subscription, Access Fee and separate Showmax subscription payable. Terms and Conditions apply. Showmax requires an internet connection of at least 2Mbps. On the DStv Explora, an uncapped connection with at least 4Mbps is recommended for the best experience. Where do I find ShowMax on my DStv Explora? Scroll the content using LEFT and RIGHT arrows, press i to find out more info and press OK to select a show. How do I sort the ShowMax content? You can sort or filter the content by pressing OPTIONS. The filters available are : All, Hollywood, Best of British, kykNET, Mzansi and Kids. How do I search ShowMax content? Search results will show any matching results in Showmax and also indicate if results have been found in the other sections of the DStv Explora (your Playlist, DStv Catch Up and BoxOffice). How do I sign into ShowMax? Once you’ve found something you want to watch, press PROFILE to sign in to Showmax with your Showmax address and password to watch Showmax content. 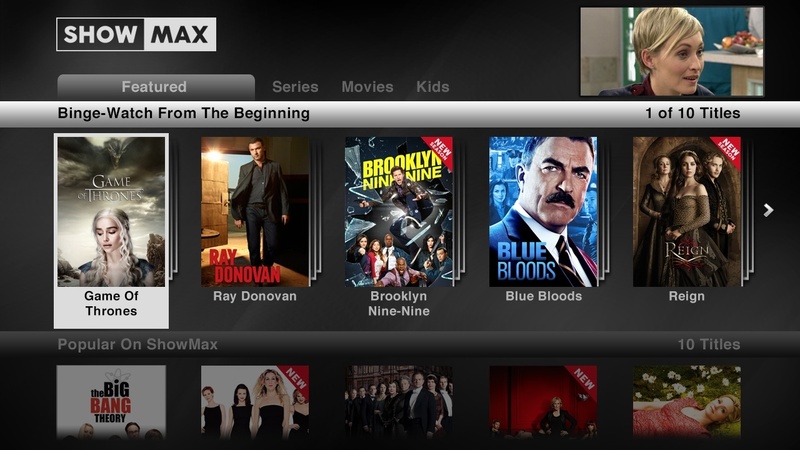 You can only create a Showmax account and subscribe for Showmax on the Showmax website. You only need to sign in once, and don’t need to do this each time you want to watch something. 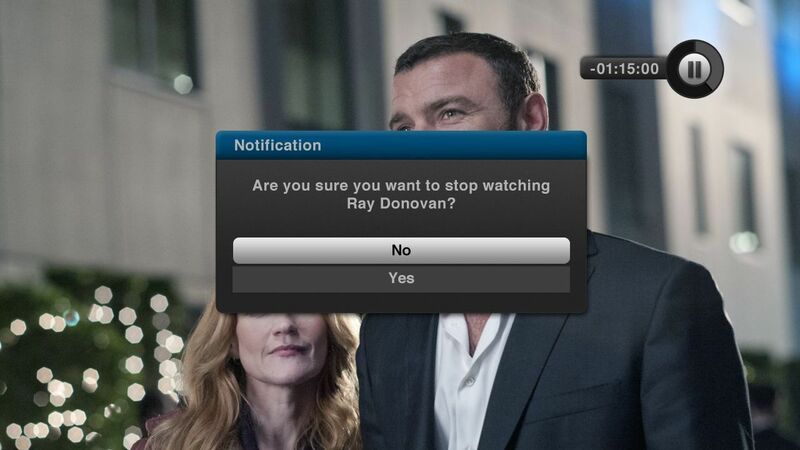 Once you’ve found something to watch and you’ve signed in, simply press OK and select “Watch”. Playback of the content will start within 30 seconds. You can Pause, Rewind, use Slow Motion and also Fast Forward through any portion of the content which has already been downloaded. If an error occurs while you’re watching, a message will appear on screen. When you want to stop watching something, you will be asked to confirm that you want to stop Playback. It’s important to remember, that once you’ve pressed STOP, you won’t be able to resume watching from the same place you stopped and will need to watch from the beginning again. Showmax does not make use of the Parental Control levels that you have set on the DStv Explora. 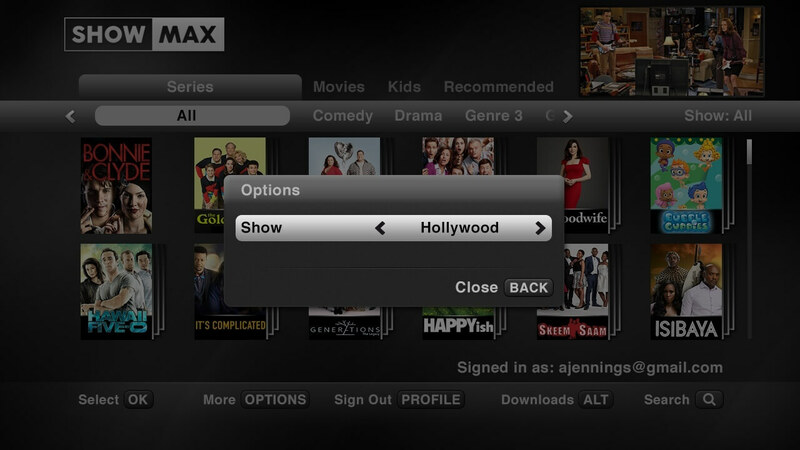 You can however control viewing of Showmax content by using Showmax Blocking in the Parental Control menu. When Showmax Blocking is switched “on”, you’ll need to enter the valid PG PIN each time you select to watch something in Showmax. How do I add my ShowMax subscription to my DStv account? If you pay your DStv account via debit order, you can add your ShowMax subscription to your DStv account and your R99 Showmax subscription will be collected via debit order together with your DStv subscription. Your DStv Connect ID also allows you to manage your DStv account. If you don’t yet have one, you can register here. Why do I see this screen when going to Showmax? You’ll only see this screen if your DStv Explora is not connected to the internet, or if there are connectivity issues. Will I be able to access Showmax if my DStv subscription hasn’t been paid? You will not be able to access Showmax on your Explora is your DStv subscription is not paid – your Explora needs to be active for Showmax to work. However, you will still be able to access Showmax on other platforms such as through your smart TV, tablet or smartphone. What type of internet connection do I need so I can use Showmax on my DStv Explora? Showmax requires an internet connection of at least 2Mbps. On the DStv Explora, an uncapped connection with at least 4Mbps is recommended for the best experience. Does Showmax use the language preferences that have been set up on the DStv Explora? No. If an English soundtrack exists, it will be used. If an English soundtrack does not exist, the next available soundtrack will be used. 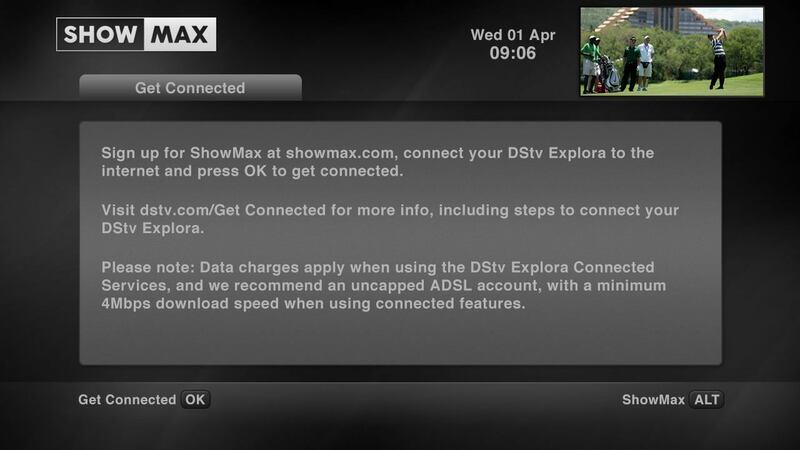 The option to download Showmax content for viewing later is not currently supported on the DStv Explora. Are subtitles available on Showmax content? Subtitles are not currently supported. Will the Showmax content be in HD? Yes, selected content will be available in HD. Where HD is available, you’ll be given the option to watch either SD or HD. Can I schedule downloads of Showmax content (as I can with Catch Up)? This feature is not yet supported. Showmax content can only be streamed. Will Dolby Digital / Surround Sound be available on Showmax content? Yes, selected content will have Dolby Digital / Surround Sound. Does Showmax have trailers for their content? Yes, trailers are available for selected content (not just movies, but other shows too). You need to be signed in to watch trailers. If a trailer is available, it will appear in the action list displayed when you press OK on a title. Does the usage calculation in the Download Manager include Showmax data usage? Do I need to sign in for Showmax each time I want to watch something? How do I sign out of Showmax on my DStv Explora? 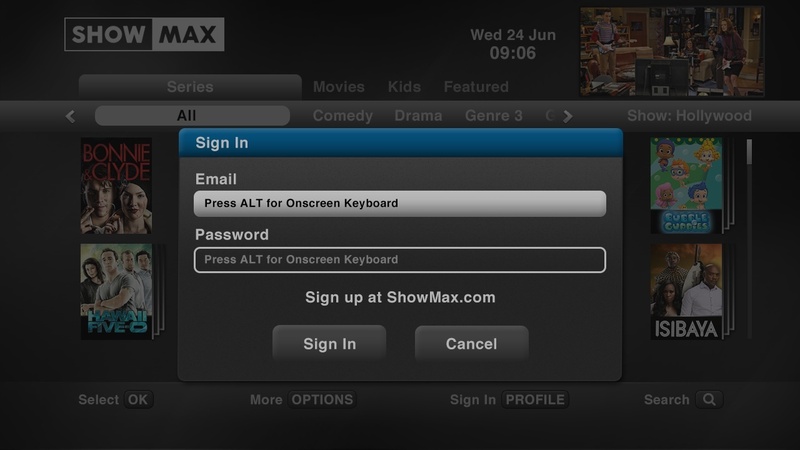 You can sign out of ShowMax from any of the ShowMax screens simply by pressing the PROFILE button and signing out. Is there a time limit as to how long I can pause Showmax content for? 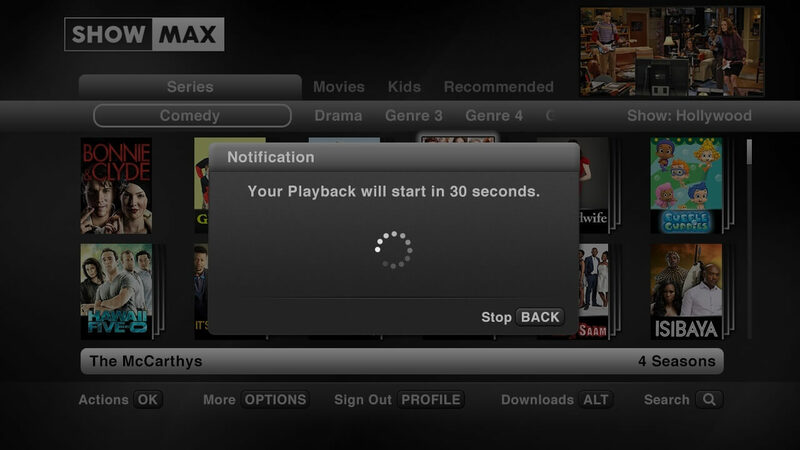 There is no time limit, however playback will automatically be stopped when the decoder reboots for daily maintenance. I signed up to Showmax using my Facebook or Twitter account, but when I try sign in to Showmax on DStv Explora using these details, they are not recognised. Why am I seeing ShowMax content in search results? 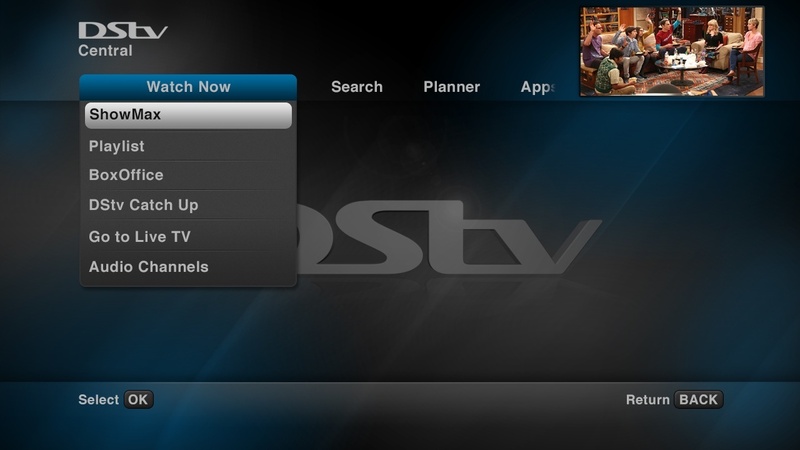 Anyone who has connected their DStv Explora to the internet (and switched connected services “on”) will see ShowMax content in search results. If you’ve got any questions about using Showmax on your Explora, drop us an email or visit our forums and we’ll be happy to help.